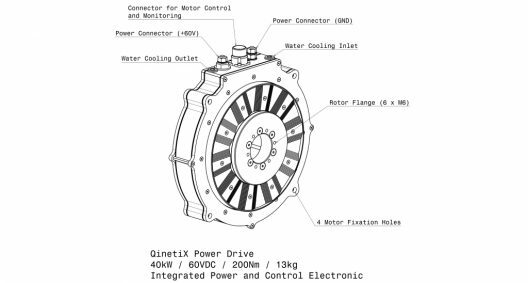 QinetiX GmbH in Germany manufactures a motor and controller combined in one case to lower weight and simplify installation. Their QPD-40, shown at the Aero Friedrichshafen E-Flight Expo and on their web page, seems to exemplify those goals. Its 12 kilogram (26.4 pound) weight and 40 kilowatt (53.6 hp.) output gives it a power-to-weight ratio of 3.2 kilowatts per kilogram (2 horsepower per pound). Running on 60 Volts at a maximum 680 Amperes, the motor produces 212 Newton-meters (156.4 foot-pounds) of torque, swinging a propeller at only 1,800 rpm, allowing for quiet operation. 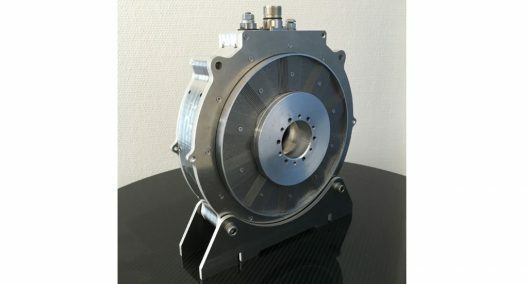 The liquid-cooled stator and power electronics will require some form of heat exchanger, but probably with fairly low cooling drag overall. Only 90 millimeters (3.54 inches) thick and around a foot in diameter, the motor should fit neatly into streamlined propeller spinners. Other uses in automobiles and wind turbines present hopeful potential applications for this neatly-packaged motor.